Acer griseum (Paperbark Maple) is a species of maple native to central China, in the provinces of Gansu, Henan, Hubei, Hunan, Shaanxi, Shanxi, and Sichuan, at altitudes of 1,500–2,000 m. It is a small to medium-sized deciduous tree,reaching 6-9 m (20-30 ft) tall, 5-6 m (15-25 ft) wide, with a trunk up to 70 cm(2 ft) in diameter. The bark is smooth, shiny orange-red, peeling in thin,papery layers; it may become fissured in old trees. The shoots are densely downy at first, this wearing off by the second or third year and the bark exfoliating by the third or fourth year. The leaves are compound, with a 2–4 cm petiole with three leaflets, each 3-10 cm long and 2-6 cm broad, dark green above, bright glaucous blue-green beneath, with several blunt teeth on the margins. 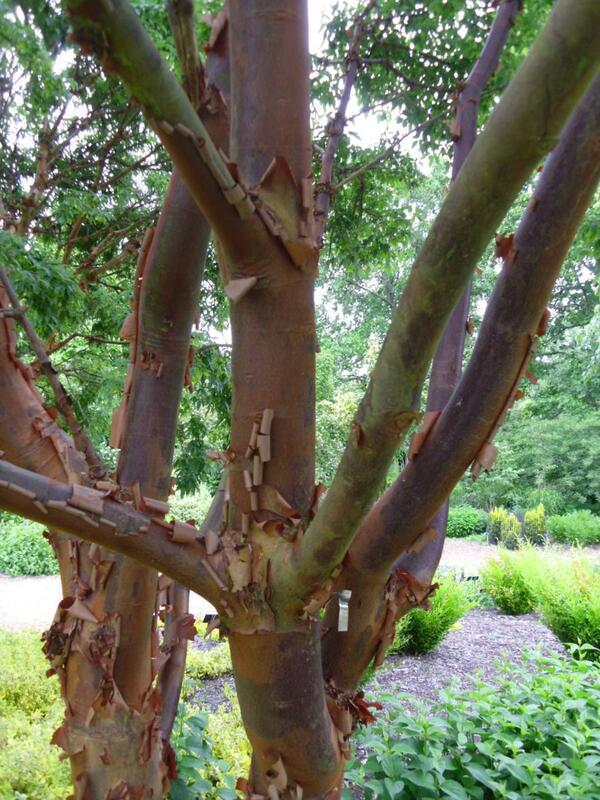 Paperbark Maple is widely grown as an ornamental plant in temperate regions. It is admired for its decorative exfoliating bark, translucent pieces of which often stay attached to the branches until worn away. It also has spectacular autumn foliage which can include red, orange and pink tones. 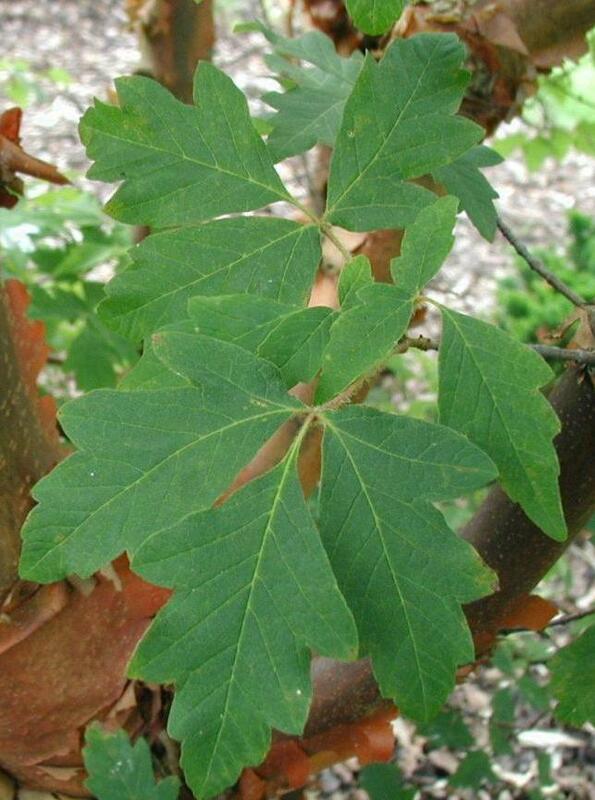 In the world of trees, Acer griseum is a small species, generally growing to around 12m in height. But what it lacks in stature, it more than makes up for in beauty. Its copper-red bark ensures that it is easy to identify, even in winter, as does its technique of bark renewal. As the old sheaves of bark die,they peel themselves off revealing the young, smooth bark beneath. This self-exfoliation, although unusual, is not unique and also occurs in several species of birch. At the turn of the 20th century, the Royal Botanic Gardens at Kew sent a young botanist by the name of Ernest Henry Wilson to China. As well as looking in to the effect the charcoal industry was having on the forests, Wilson was also asked by his financier, the Veitch Nursery, to find interesting plants. The plan was to find the handkerchief tree Davidia involucrata which had been described, but never collected. Eventually, Wilson found the location where the tree was last seen only to find a tree stump and a newly-erected hut built from its timber! Over the next decade or so, 'Chinese'Wilson, as he was to become known, brought back more than 1,000 garden plants -more than any other collector. This eventually included the handkerchief tree, the regal lily Lilium regale and also the Paperbark Maple Acer griseum. 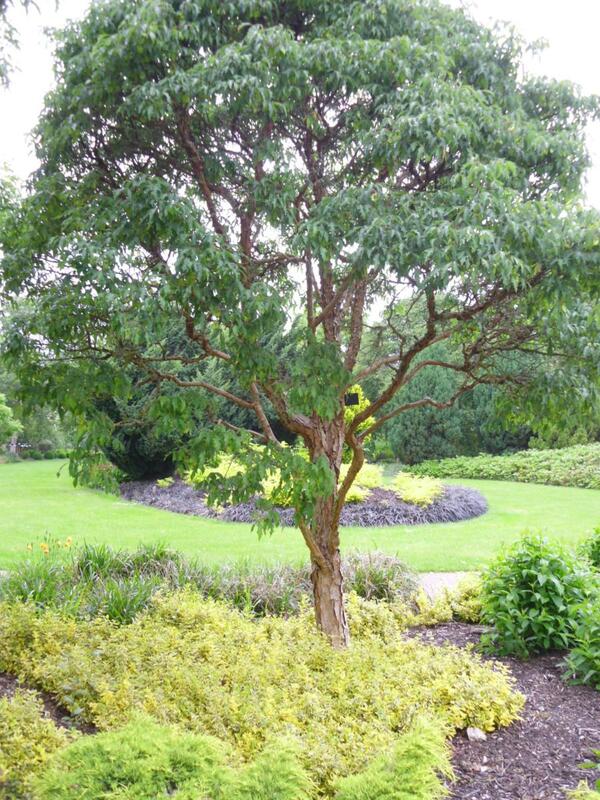 Uses: Ideal as a specimen.If you only have room for one tree, this one must be in anyone's Top 10!